This book was a real disappointment to me. There was something about the manner and style of the content that didn’t set right with me. I will concede that I’m probably not the best person to make a review on this book. I’m not particularly interested in the cryptid field of phantoms and beasties, I only bought the book because the stories are mostly based in the southern USA and I thought it was supposed to tell of wee nature folk encounters. Mr. Coleman told of one momentary gnome sighting that he & his sister had when they were children. 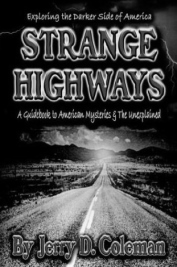 Strange Highways by Jerry D. Coleman is probably a really a good book to anyone who’s interested in the cryptid/phantom field. For better more thorough reviews here’s a link to the book listed on Amazon.com. It has a many reviews by folks who go in depth with their comments about the aspects and stories.